The eBECAS Classing module assists with the allocation of students into classes and the management of college timetabling. 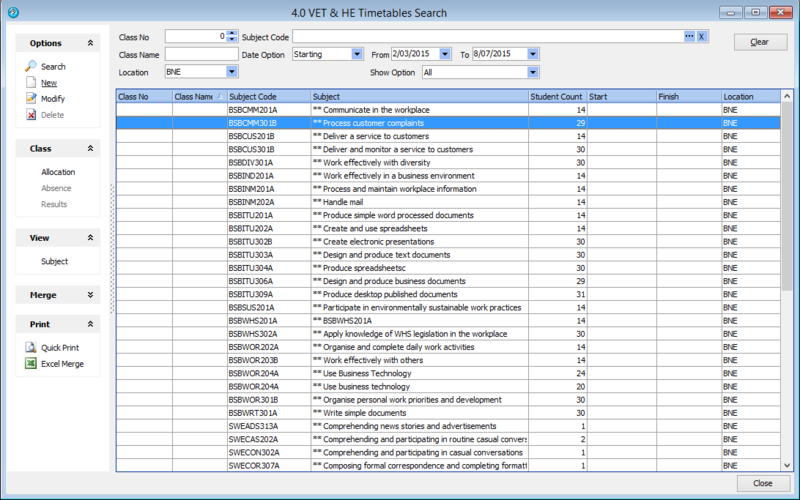 VET enrolments that are based on subjects studied for a period during the enrolment. 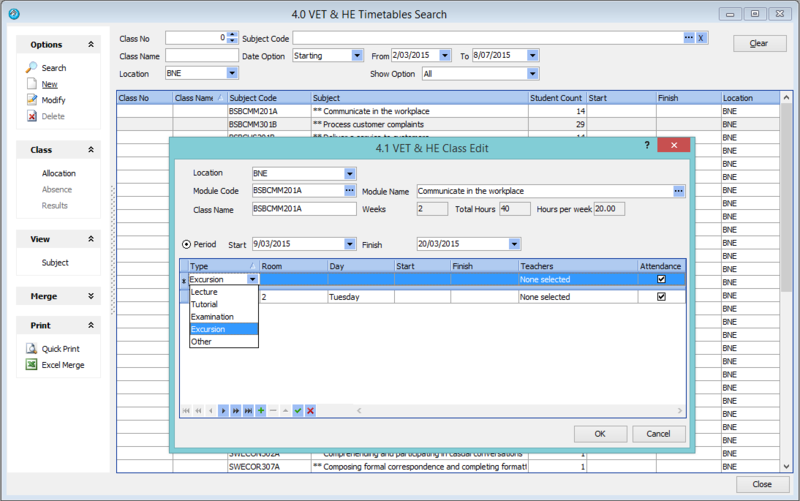 VET RTO Classing enables administrators to allocate students to classes with specific teachers, rooms , days and times. This enables students and teachers to see their timetable via the student and teacher portals. Teachers can use the teacher portal to mark attendance, and enter VET competencies using the portal via a computer tablet or smart phone. VET classing enables you to define subjects to be studied for any period within the enrolment, with classes assigned for days and hours in specific rooms with specific teachers. VET, Foundation and Higher Education Classing is based on subjects studied for a period / semester. Each subject is studied for a specified number of hours and weeks, and defined by the day or date and hours. 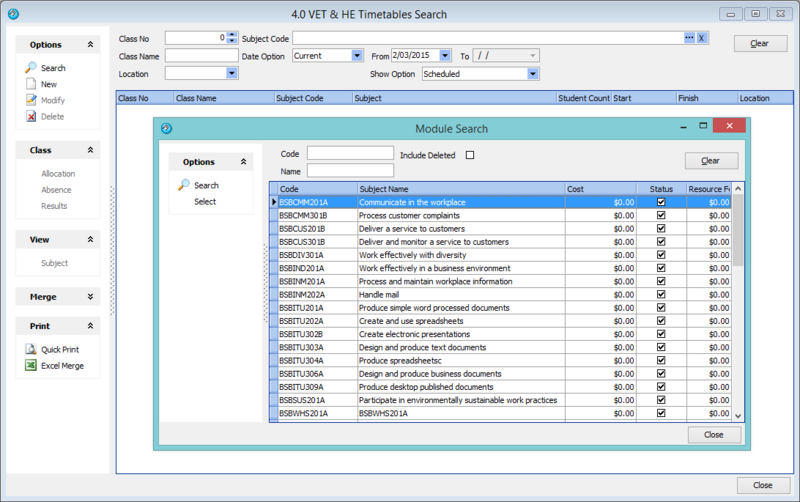 VET Classing integrates with AVETMISS result submission for Australian Colleges – results and outcomes are posted once for each subject/module and optionally each competency. Foundation and Higher Education Classing enables you to enter results and grades once for each subject. eBECAS can be used by Colleges for many different types of courses. Aside from Language courses, colleges can use eBECAS for Foundation, University and Vocational based courses. The following will provide you with some information and examples about how these course are typically set up and run in Australia. Colleges will often purchase Training Packages, an example of these can be found at www.ntis.gov.au. For example, there is currently a training package available with the title – Hospitality Training Package – and the code THH02. There are many different qualifications at several levels. A certificate 1 has two qualifications: Certificate 1 in Hospitality (Operations) code THH11002 and a Certificate 1 in Hospitality (Kitchen Operations) code THH11102. The Certificate 1 in Hospitality (Operations) has 7 units, 5 core and 2 elective. The core units are: THHCOR01B Work with colleagues and customers, THHCOR02B Work in a socially diverse environment, THHCOR03B Follow health, safety and security procedures, THHCOR01B Follow workplace hygiene procedures and THHCO01B Develop and update hospitality industry knowledge. Each unit has performance criteria and key competencies. Each unit must be defined with the total number of hours involved and the length in weeks that the unit will be taught. 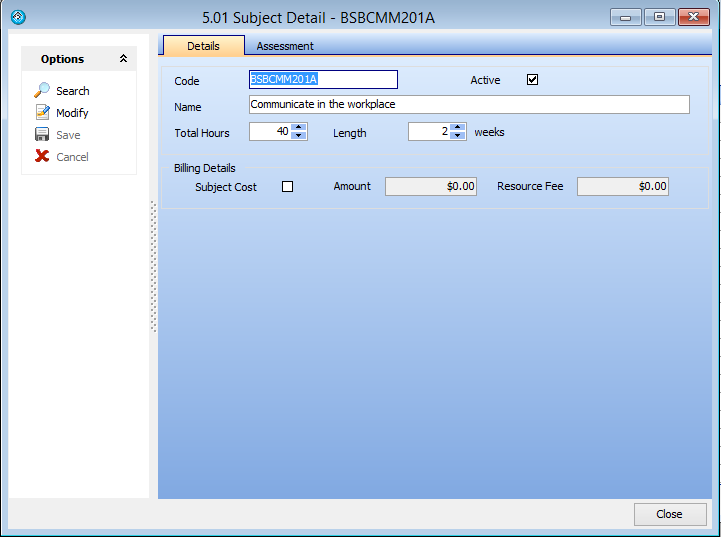 You also have the option to additionally define and store the assessment items for the unit. In the below example, these are the competencies for the unit. 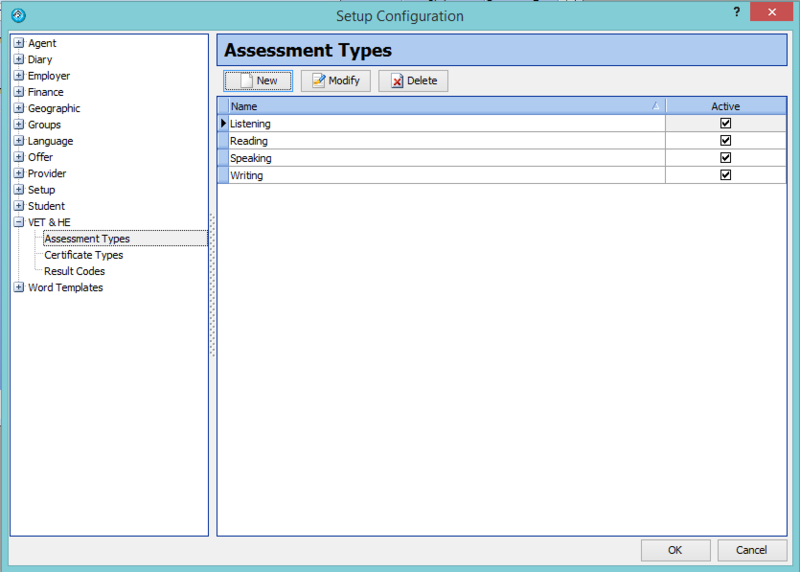 To add and store an assessment item that is a competency type, you need add this type. Please go to Main – Utility – Setup Configuration, Academic – Assessment Types. 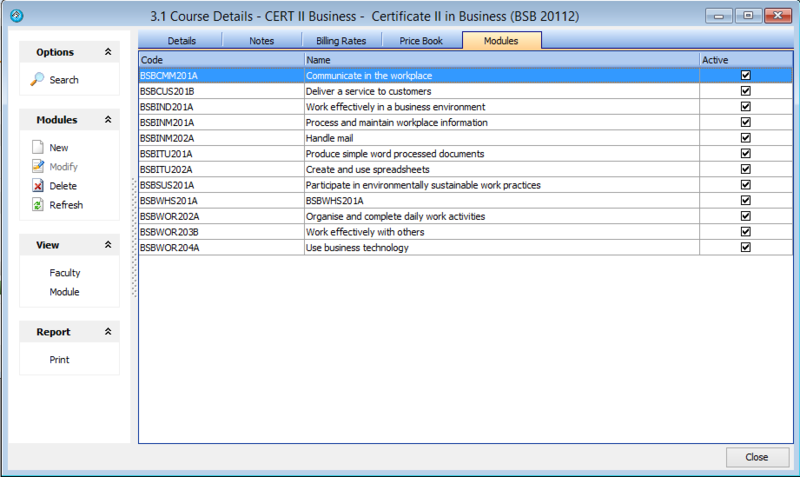 Now if you return to the module details window you will be able to enter the assessment items (competencies) for the module / unit. To specify a course go to Utilities – Courses. You can search courses and add a new course. You can specify the course code, faculty, course name & display name, number of hours per week (if not specifying module hours), course length, cost, CRICOS code and CRICOS name. Details about the course can be listed in the notes tab. 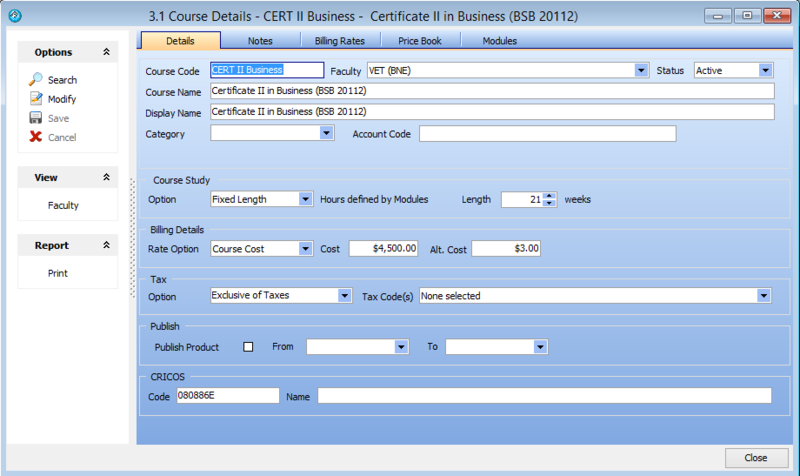 The billing rates tab is designed for weekly course rates so would be not used in this circumstance. The price books tab is used for weekly course rates with break points for different countries. You may also need to define modules that are studied in VET courses. The modules tab in the course details enables you to add/define the CORE modules and optional elective modules (units) for the students that are studying that course. Once you have defined these modules, when a new student enrolment is added for that course, the student will have those modules (units) listed as waiting for the student to study. We suggest that electives are added to the enrolment details following an interview with the student. While we can display the classes under the Classes tab, the class details window provides more details such as room, day / date / times & period. Once the modules (units) that need to be studied have been specified and students are enrolled, you will need to schedule classes. To allocate academic classes please go to Main – Classes – Academic Classes. A class is a module/unit studied for a period of time. You are able to specify what day/s and what time the class is scheduled and any other events the student should attend for that class such as lectures, tutorials, examinations or excursions. Below is a screenshot of Screen 4.0m the Academic Timetables Search, which displays all classes and the number of students in each class. Students can be assigned/added to a class by pressing the Allocation option, on the left hand panel, while highlighting the class. The students already assigned to the class will be displayed; you can also export this list of students to Ms Excel. To add additional students to the class, press the new button and a search screen will be displayed that lists the students who have not studied this module (unit) and are scheduled to study this module. Details about the students listed in the search can be displayed and sorted so that you can select the most appropriate students for allocation. 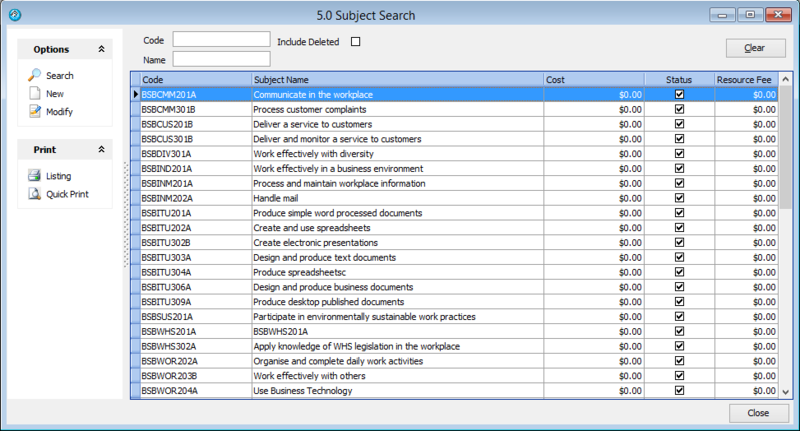 You are able to enter absences by class from the Academic Timetable Search screen 4.0. You can enter results and print by class from the Academic Timetable search screen 4.0.